The best productivity software is always the ones which help without being too intrusive. You don’t want to spend more time working on the software than you save by using it after all. In other words, the technique or theory behind the software is often more important than the software itself. Combined with the need to keep things simple and effective and the obvious time-keeping technique to use is the Pomodoro Technique. This technique involves choosing a task to work on, then splitting your time up into half-hour slots called “pomodoros”. 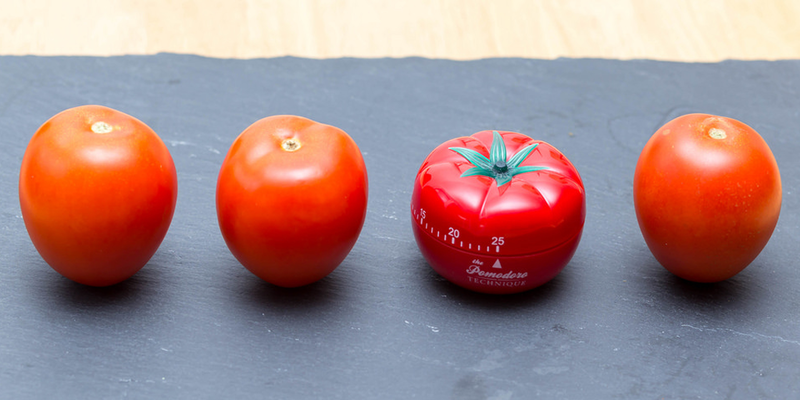 Each pomodoro consists of 25 minutes of work, followed by a short 5-minute break. Then, every four pomodoros (or three, depending on what works for you) you should take a 10-minute break instead of a 5-minute one. All of these fulfill the basic purpose of making sure that you stay aware of the time you spend on every task and (by keeping track of what you spend your pomodoro sessions doing) how long various activities take to complete. As a quick further recommendation, check out Focus Booster if you want to take your pomodoro or time-tracking efforts to the next level. This allows you to automatically log your pomodoro sessions into a timesheet. The free plan is too limited to recommend for heavy use but if you don’t mind paying a small yearly/monthly fee, it’s a great way to help you stay productive. Office 365 (Microsoft Word, Excel, etc) has a huge presence in the documentation software sphere, and for good reason. It’s easy to use, most people learn to use Word and Excel as their first word processing/spreadsheet programs, and they can do pretty much anything you’d want out of basic documentation software. Unfortunately, it’s terrible for documenting processes and workflows (more on that in the next section), and for creating dynamic spreadsheets to easily store and link data together. Office 365 is designed to store information in its most basic form. It’s not kitted out to serve as productivity software. That’s where tools like Airtable and Trello come into play. Now, since this is a beginner’s introduction to productivity software I’d recommend only using one of these tools at the most. Trello and Airtable can both be a little intimidating and serve largely the same purposes (especially now that Airtable can create kanban boards), so there’s little point wasting time with learning more than one app. To summarize, Trello is easier to learn but less useful to a large team. Trello allows you to create kanban boards which you can use to organize your tasks easily. Think of it like a cork board in an office which people split into columns and stick notes on to represent tasks. It’s a great visual aid to your task organization. 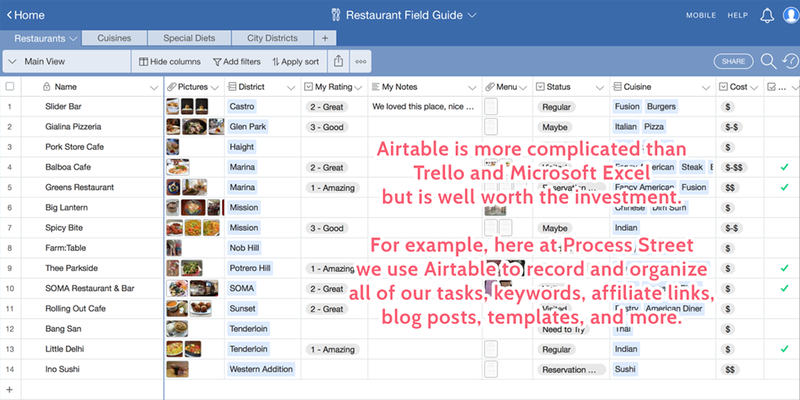 Airtable, meanwhile, is better for teams that have a lot of information to track or need multiple different views and complex data entries. Think of it like a database which consists mostly of spreadsheets to store information, going further than Excel by letting you link entries together to create a web of related data, organize them into filtered views and boards, put them into alternate views such as calendars and kanban boards, and much more. Basically, Office 365 is good for creating basic files (Word documents, spreadsheets, PowerPoint presentations, etc) but if you want to boost productivity through documentation software you’ll need something to easily sort and organize those files. It’s easy to get complacent when it comes to processes and workflows. Corners get cut, faults and/or mistakes are glossed over, inefficiencies go unnoticed and any benefits from your productivity software get nullified by inefficient systems. To stay on track you need to create a process for everything. That’s why workflow management software is a vital part of your productivity stack. Process Street is perfect for documenting, tracking, and organizing your team’s processes and workflows. Better yet, you can try it for free by signing up here. Process Street lets you create process templates which you and your team can use to complete tasks perfectly every time. These templates have space for you to write instructions for every task, upload supplementary files, images, and videos, and even leave space for data to be entered while working through the process itself. Checklists can then be run from your templates to record someone’s progress in real time. People can be assigned to individual tasks or entire checklists depending on what’s relevant to them, and their permission levels can be controlled by their team leaders. Nobody can see, access or edit anything that you don’t want them to. Figures outside of your organization can even be invited to work on singular processes as “guests” – users with very limited permission levels. Your checklists can also be easily tracked using our template overview tab – a view to see the status of your checklists, which tasks have been completed, any files that were uploaded, and so on. In other words, it’s the perfect business process management software. Try out Process Street for free here or click here to request a demo. A huge part of being productive is the ability to stay focused and work at a steady pace. This is the difference between panicked rushes towards the end of your deadlines and a calm, consistent, higher-quality approach. Now, I’m no stranger to losing focus. Heck, my degree saw me in the library typing essays until 6 am more times than I can count, and I struggled to kick that awful habit of procrastination. Then I set out to find how to improve productivity. Along with using the software mentioned in this post (and testing much more besides the fact), a huge part of that was figuring out how to stay focused. The answer is to get your environment right. In terms of productivity software, this means music and/or background noise. 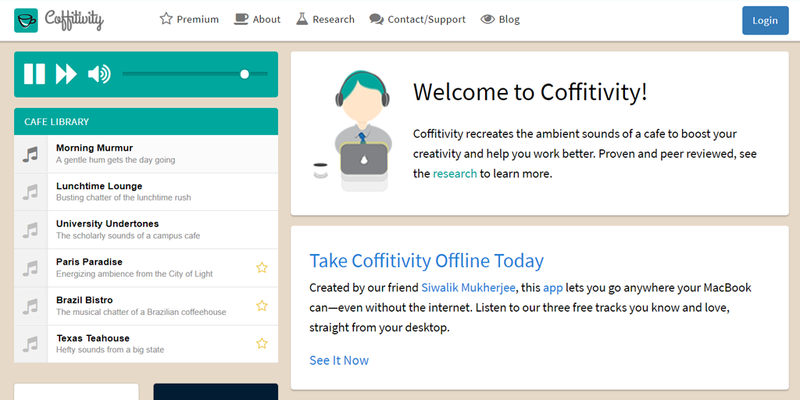 Coffitivity is a fantastic website and mobile app which plays the kind of background noise you’d find in a busy coffee shop. It’s enough to fill dead air and stop your brain getting bored but indistinguishable enough that it’s not distracting. No conversations are actually taking place to steal your focus – it’s all just the low murmur to set the scene. Alternatively, if you prefer music, I’d recommend using either Spotify or YouTube depending on your tastes. Spotify is great for those who don’t mind what they listen to and aren’t distracted by music with lyrics. Their daily mix playlists play music based on the songs and artists you listen to and like, giving you a nice mix of familiar and new songs to set a good working tone. The trouble with Spotify is that the constant ads on the free plan are distracting as anything, and some people (myself included) find that lyrics are sometimes too distracting to listen to while you’re working. YouTube is a great alternative if you really don’t want to pay for your music and hate the persistent ads of Spotify. I often switch between the two, using Spotify for tasks that don’t require too much focus and then YouTube instrumental or focus music mixes to power through the heftier tasks. Sometimes simple is best, and that’s certainly the case with your email services and software. 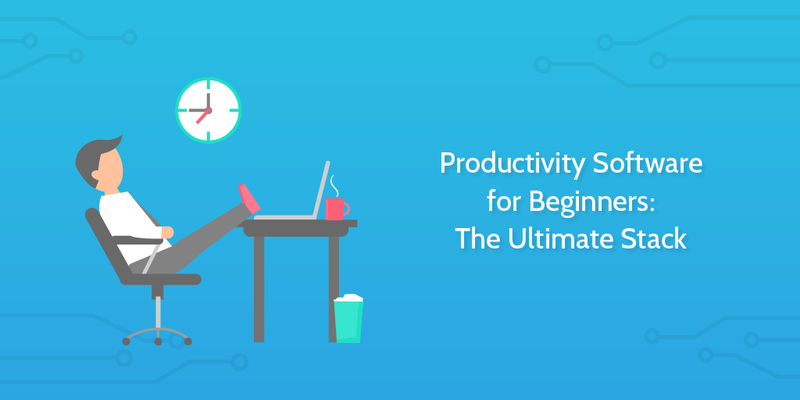 There’s not much to talk about in terms of the tools you should use, as if you’re just starting out with productivity software there are other things you should be worrying about instead that will see bigger benefits. Gmail is free to set up, lets you create filters and assign your messages a signature, and will generally serve all of your basic email needs. The only real downsides come when you need to manage multiple email accounts, set up automated email campaigns or auto-responses, and so on. However, I wouldn’t class any of these use cases as “basic” productivity software – they’re dedicated business tools designed to help with specific tasks and make certain techniques possible. They do very little on a personal productivity scale. Don’t get bogged down in tools you don’t need. 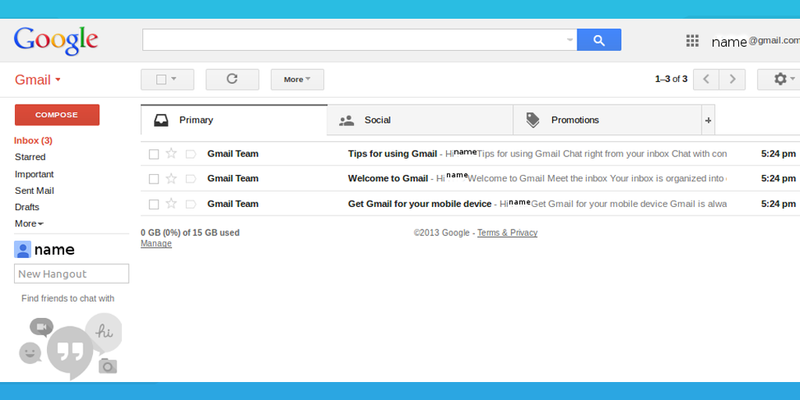 Gmail is more than enough to cover your basic email needs. Productivity relies on many things, one core aspect being the accessibility of your work and the resources needed to complete it. If you’re not using cloud storage, your work and resources won’t be easily available at all times. That’s an instant blow to you and your team’s effectiveness. Much like with email software, the basic needs of your storage solution can be fulfilled easily to get a base level of productivity. You don’t need five flashy apps or a bunch of complicated setups. All you need is Google Drive. It’s free to use (up to a point) and can use your Google account, linking your files with anything else that might also use that account (such as Google Docs). 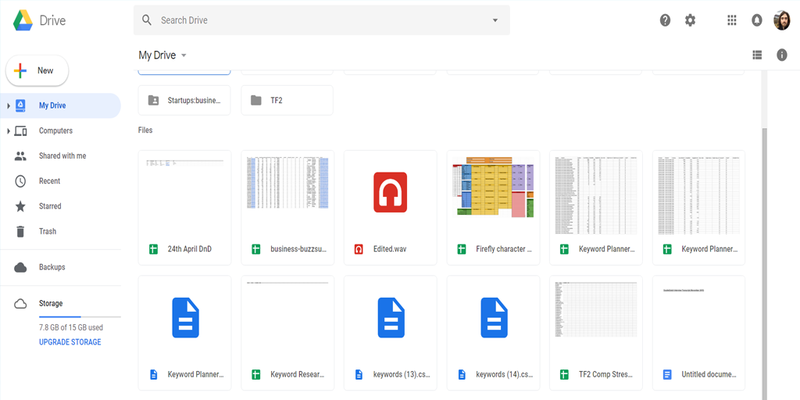 Not to mention that Google Drive also lets you control the accessibility of your files, meaning that you can give people access to see and/or edit files that are relevant to them without revealing your entire library. This lets you avoid the bus syndrome – the idea that a single person being unavailable could cripple your team. The relevant work will always be accessible through sharing your files, so there’s less dependent on you always being available. Communication is the heart of collaboration. If you can’t easily talk to and meet with others, you’ll quickly hit a brick wall in terms of how much progress you can make. You need software to let you stay connected at all times and easily manage your conversations. The best way to do that is to use Slack and Zoom. 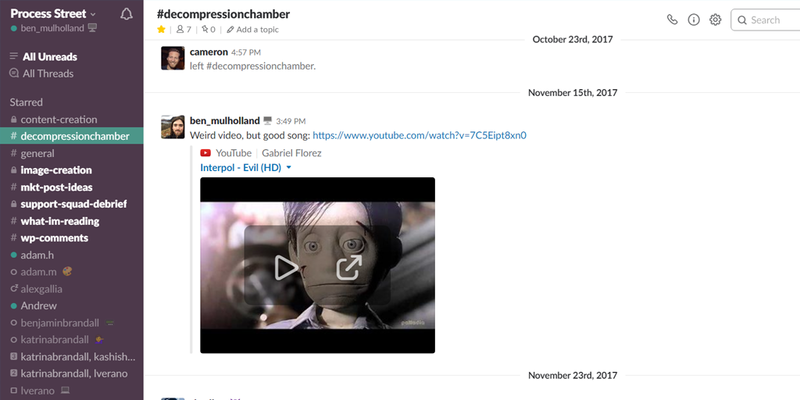 Slack is one of the best team communication apps out there. Their free plan is incredibly generous and the software itself lets you organize your conversations in almost any way you’d like. With built-in integrations, the ability to search for and reply to specific messages, upload files and have fun while you chat, there’s little more out could want out of a chat app to help you stay productive. Zoom, meanwhile, is a video conferencing app that I will wholeheartedly recommend over Skype. Zoom once again has a generous free plan, has a more modern and smoother design than Skype, is easier to use and has more in-depth features. Heck, we didn’t name it our best video conferencing app for no reason. Not everyone needs dedicated writing software to be productive. Much like other tool categories, if you focus too much on getting the perfect fit you’ll waste a huge amount of time learning various tools only to drop them later on. We’re not trying to get your perfect stack or single-handedly build a blog. No tool will suit everyone in the same way and obsessing over your productivity software to that level rather than your actual output defeats the point of trying to be more productive in the first place. To that end, unless you’re writing all day every day then software like Office 365 and/or Google Suite should be more than enough to let you get the job done. The software is familiar to almost everyone and you don’t need any special tools to succeed at a basic level. I would, however, highly recommend picking up Grammarly. 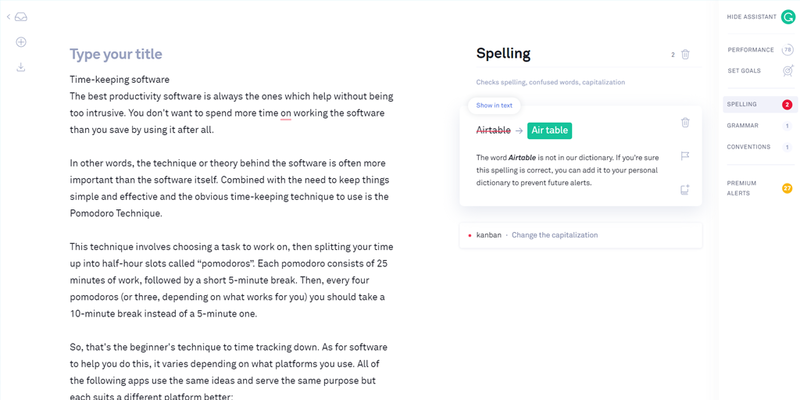 Like many other tools in this post, it has a generous free plan that lets everyone have automatic spelling, grammar, and punctuation corrections suggested as they type. The browser plugins make for easy access and it’s compatible with most sites, making it free, easy to use, and widely applicable. If you ever find something that isn’t automatically checked with Grammarly you can create a new document inside Grammarly and paste in your text to check it there instead. For anyone who writes a lot or gets distracted too much while working in Microsoft Word or Google Docs, I’d suggest trying out Quip. It’s a writing app that’s still easy to use and helps eliminate distractions by having a blander design. The only reason I’m not recommending it for everyone is to keep things simple – the other apps will do the job for general use, so there’s no need to clutter your tech stack with extra apps unless you need them. To summarize, let’s bring together a productivity software stack that anyone case use as a base. I won’t pretend that this will have everything you’ll ever need but that’s not the point of this post. The point is setting a base level of productivity which you can then improve by testing other, more specialized apps. The only other app I’d like to mention briefly is Zapier. It’s far from a “beginner’s” productivity app but it’s an incredibly useful and powerful tool you can use to link your apps together to automatically take care of tasks. Until next time, stay productive! What productivity software do you use? Are there any tools I missed which you’d recommend to a beginner? Let me know in the comments below!